Home Biblical Christian Articles Winds of Doctrine Eternal Fire Exists! 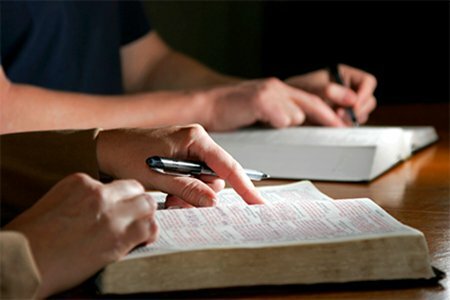 The truths of Scripture are vast, profound and harmonious. At times, certain texts can appear to contradict other texts because of incorrect understanding or insufficient knowledge. One area of widespread confusion concerns the reward of the wicked. Scripture teaches, “The dead know not anything.” (See Ecclesiastes 9:5, 6.) However, it also teaches eternally burning fire that never goes out. The truth that harmonizes these two, seemingly contradictory points is beautiful and faith affirming. Before his fall, Lucifer was the covering cherub. The ceaseless beams of light and energy flowing from the Creator bathed him in the perpetual light of sunless day. As the covering cherub, Lucifer dwelt in the eternal fires of the Omnipotent’s immediate presence. He walked unscathed in its flames. Thou art the anointed cherub that covereth; and I have set thee so: thou wast upon the holy mountain of Elohim; thou hast walked up and down in the midst of the stones of fire. 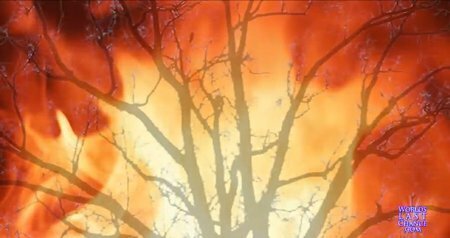 Likewise, when Yahushua in His pre-incarnate form appeared to man, He sometimes had the appearance of fire. Since Yahuwah Himself is a consuming fire, the closer one gets to Him, the closer he comes to the eternal burnings. After spending 40 days in the divine presence on Mount Sinai, Moses’ face reflected the divine glory he had beheld to such an extent that the people were frightened by it. Now it was so, when Moses came down from Mount Sinai . . . that Moses did not know that the skin of his face shone while he talked with Him. So when Aaron and all the children of Israel saw Moses, behold, the skin of his face shone, and they were afraid to come near him. Then Moses called to them, and . . . he put a veil on his face. The very presence of Yahuwah is eternal fire in which only the righteous and holy can survive. Wherever sin exists in the presence of Yahuwah, the eternally burning fires of a holy Eloah consumes. 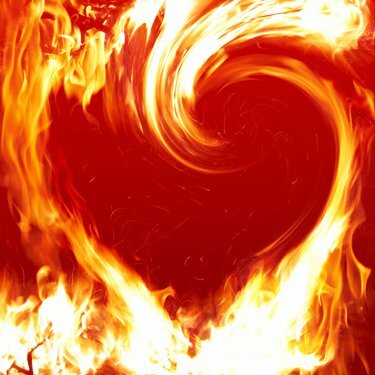 People with unsanctified hearts are terrified in the presence of eternal burning. When Yahuwah spoke from Mt. Sinai, the people were panic-stricken. How interesting! These two men who had been “devoured” by “fire” that came out from Yahuwah still had their clothes intact! If someone were to point a flame-thrower at you long enough to kill you, how do you think your clothes would fare? They would burn up faster than your body, which is largely water! Something was consumed: the ropes that had bound them. The men themselves were unharmed. Even their clothes were not damaged! The secret of how these brave men, heroes of Heaven, were delivered is simple: they were standing in the presence of the Son of Yah! All who have surrendered their wills to the divine will and live in harmony with the divine law can live, unhurt, in the consuming fires of the Almighty’s presence. By being obedient to the Law of Yah, the three worthies could live in the presence of eternal holy burnings and the fires of combustion had no power over them. 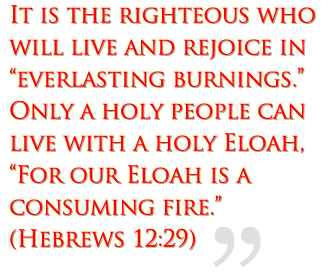 The eternal burnings of Yah's presence consume away all sin and selfishness. Sin consists of 1) Falsehood and often 2) Force (on the part of Satan). Satan is the father of lies, but truth, the eternal truth that proceeds from the One who dwells in consuming fire, destroys Falsehood. Force is conquered by divine love. The Holy Spirit is Truth and Love. At Pentecost, the Holy Spirit filled the assembled believers. “And there appeared unto them cloven tongues likes as of fire, and it sat upon each of them. And they were all filled with the Holy Ghost.” (Acts 2:3, 4, KJV) These early believers were not consumed by the divine fire. Thereafter, they were united in love and spread the gospel of the Kingdom of Heaven to all the world. “Yahuwah is love.” (1 John 4:8) He also delights in justice. 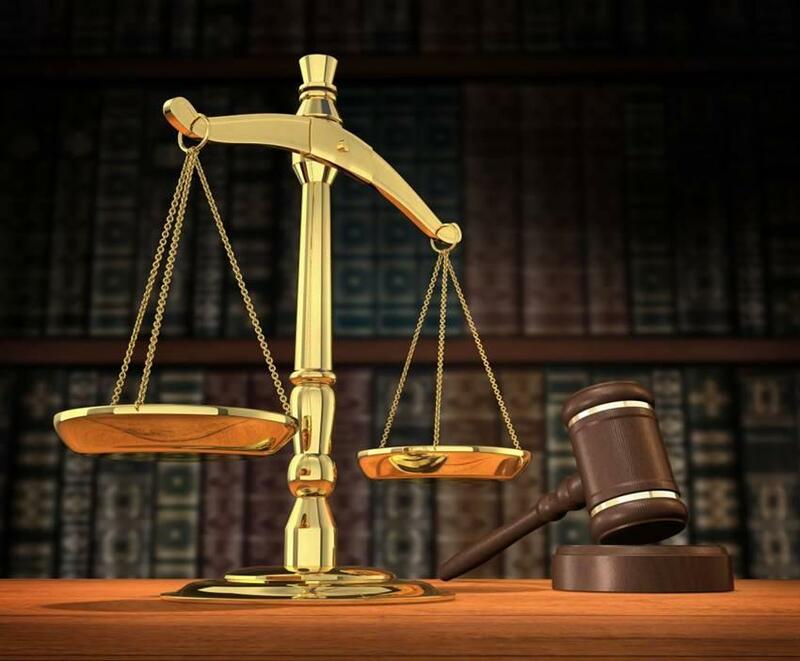 As an Eloah of love and justice, Yahuwah did not want to give eternal life to anyone while they were still under probation, making their choice to serve Him or to join Satan in his rebellion. Yahuwah did not want even the worst sinner to suffer an eternity in agony. This would not be loving or just! Eternal life is a gift. It is given only to those who overcome through faith in the merits of Yahushua. The punishment of those who choose to cling to sin is not eternal life in torment. It is death. Eternal life is a gift. It is given only to those who overcome through faith in the merits of Yahushua. “For the wages of sin is death; but the gift of Yahuwah is eternal life through Yahushua the Annointed our Master.” (Romans 6:23) The punishment of those who choose to cling to sin is not eternal life in torment. It is death. Eternal life is granted those only who choose to submit to the divine, benevolent Law of Love. 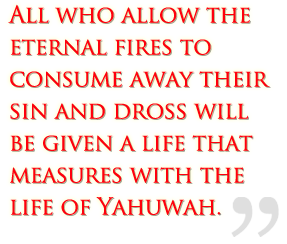 All who allow the eternal fires to consume away their sin and dross will be given a life that measures with the life of Yahuwah. The fires of Yahuwah's presence will burn throughout all eternity. It is a promise! “And the city had no need of the sun, neither of the moon, to shine in it: for the glory of Yahuwah did lighten it, and the Lamb is the light thereof.” (Revelation 21:23) The redeemed will walk in the sunless light of eternal day, rejoicing in Yahuwah’s presence. They can live in the midst of eternal burnings because they have surrendered their wills, allowing their sin to be consumed in the refining fire. Not understanding the process by which silver is refined, the women wanted to learn more so that they could fully understand the process being described in Scripture. One woman, who knew of a silversmith, offered to go and observe and report back to the group what she learned. After making arrangements with the silversmith to watch him work, she arrived at the agreed upon time. Holding a piece of silver over an open flame, the silversmith explained that, when refining silver, it was necessary to hold it in the middle of the fire where the flames are hottest in order to burn away all the impurities. The woman asked the silversmith if it were true that he had to stay there, by the fire, the entire time the silver was being refined in the flames. Note carefully the main point of emphasis is that while the immortal righteous will dwell and flourish forever in the eternal burnings of the presence of Yahuwah, this same fire will be the devouring fire of "hell" for mortal sinners who can exist in its presence only for a very short time. Yahuwah answers plainly, and tells Moses that no man can look upon Him and live. The destruction of the wicked at His Second Coming will be but a foretaste of the eternal burning presence of Yahuwah which will ultimately cleanse the whole earth of unconverted, unrepentant sinners and all semblance of sin. Satan started the controversy in Heaven and his opposition was directed at Yahuwah Whose fiery presence will do the final destruction depicted in the book of Revelation.